Yeh Rishta Kya Kehlata Hai 27th October 2016: Gayu danced with Kartik. 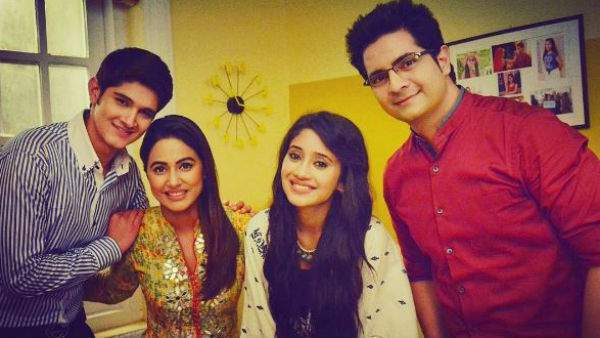 Naira joined them, but Kartik went away. Naira wiped her tears but smiled. She signed to Kartik. He was surprised. She imagined dancing with him. Rajshri came there and told everyone that moon came. Naira thought that she would break her fast with Kartik and it was a special day for her. Everyone broke their fast. Karishma was sad and she Naman’s pic. Gayu kept on smiling seeing Kartik. Naira removed the fuse. She smiled. Kartik thought to go and check the electric connection. Gayu looked for Kartik. Naira saw him coming and called out his name. Naira saw Gayu looking at the moon and then Kartik. She got shocked. She started crying. Gayu saw Naira seeing her and hugged her and said that she did not tell anyone about it. She told her that she loved Kartik a lot. Naira cried. Check: Yeh Rishta Kya Kahlata Hai 26th October 2016. Gayu said that she wanted to tell Akshara first, but it was ok that she got to know it too. She said that she had to know someday. She asked Naira as why she was not saying anything. She told her again that she loved Kartik a lot. She stated that she knew what Naira was thinking and stated that she knew that she had problems with Kartik, but even she could not deny that he was a good person. Naira stood shocked. She then asked Naira not to tell anyone and keep that as sister promise. She then went from there. Naira cried a lot. Everyone asked Naitik as what he gifted Akshara. Akshara said that they did not do anything special that time. She holds Naitik’s hand. Mohit asked Naitik if he had not given anything to Akshara. Akshara said that they had promised to give time to each other. Naitik said that quality time and smiled looking at her. Everyone then gifted them their large portrait. They both smiled. Rajshri stated that they just pray to the lord to keep both of them happy always. Gayu said that Kartik’s phone was off and thought that she could not break her fast till she talked to him. Naira cried and said that she too loved Kartik a lot.Naira called her friend and told everything and stated that she loved Kartik and Kartik loved her, but Gayu too loved Kartik. She thought why Lord created so much confusion. She thought that Gayu would understand the things when she would come to know that she and Kartik loved each other a lot. She thought to tell Kartik first. She smiled and asked her friend to keep the phone.